Young people should ditch their knives and abandon gang culture, the leader of the Catholic Church in England and Wales has said. Cardinal Vincent Nichols, the Archbishop of Westminster, urged youngsters to turn to Jesus Christ in prayer, to build friendships – and to even consider joining a boxing club rather than carry a weapon. 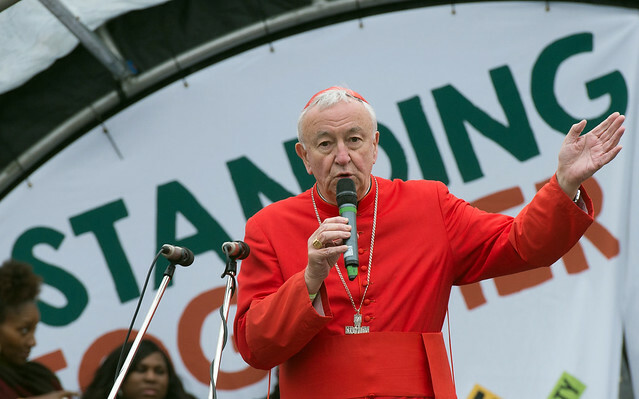 Cardinal Nichols, the President of the Bishops’ Conference of England and Wales, made his plea in an audio message shortly after he attending the Standing Together rally against knife crime in Trafalgar Square, London, on Saturday. He said: “If you or your friends are involved in gangs, try to find a way out. “If you or your friends carry or possess knives, go to one of the banks and anonymously get rid of the knife in your possession, just get rid of it. The cardinal said: “Build friendships, find places where you can go and sit and honestly talk and share your experiences with other people. He said that at root of violent crime was always the “breakdown of relationships” and he urged parents to keep talking to their children if they were worried that they were being drawn into a gang culture. “The only way of counteracting a gang culture is to create for young people a sense of belonging to something else – something that’s positive, creative and attractive to them,” said Cardinal Nichols. “I had a request from a priest this week who’s looking to start a boxing club in his parish,” he added. At present, Britain is undergoing the worst peak in knife crime since records began in 1946, with young white males constituting the majority of victims. According to the Ministry of Justice nearly 21,500 offences involving possessing or making threats with blade or offensive weapon resulted in a criminal conviction or a caution in 2018. Greater Manchester ranked the third worst region in the country for knife crime after London and the West Midlands, with 1,016 knife crimes – the highest level since 2011. Two recent fatal stabbings have occurred in Hale Barns, Cheshire, and Wythenshawe, both within the Diocese of Shrewsbury.